It’s a pretty daunting question. And it gets even more intimidating when you realize you don’t have an answer. In fact, you may be so far from having an answer you feel like shouting every time someone asks you about your next step. If you’re a recent college or university graduate, you are probably experiencing some mixed feelings about your accomplishment – some joy and some sadness. To help you get ready for what’s coming in your post-college-graduation-life, here are some realities that might be coming your way. 1. You will be questioned by someone every day. What’s your next step? Do you have a job? Have you considered applying at ….? The questions are plentiful and never-ending. 2. You consider options that were never options before. Pre-graduation: I will never move back in with my parents. Post-graduation: So this whole rent thing won’t work with the $40 left in my bank account. Mommy? 3. You will miss college more than you thought. You would honestly prefer the secureness of an exam over the mystery that your future has become. 4. You will cry for no reason. You’re officially an adult. That’s a reason to cry in and of itself. 5. You question everything so much more. Gone are the simple days when you had school as a fallback. Every decision seems more serious, because it kind of is. 6. Your loans start catching up to you. Those carefree college years are long gone. Whether you have a job or not, it’s time to pay off that degree. 7. You begin to learn the difference between working to live and living to work. Realistically, you’re going to have to bide your time at some point and just do what you can, as opposed to what you want. 8. You have a heightened awareness of the expectations on you. Now that you have a big, shiny degree, people expect you to be awesome and have your life together. Yay, pressure. 9. You will really begin to see the world as your oyster. Opportunities are open left and right. It might be difficult pinpointing exactly what you want to do, but the world is at your feet. 10. You won’t miss things you thought you would. You think you will miss the bustle of living on campus, but the nostalgia isn’t as real as you expected. 11. You get more excited about the little things. Yes! There’s ice cream in the fridge. You don’t have a job and you’re drowning in loans, but at least you have dessert. 12. You can finally prove yourself to the world. You’ve spent the past four years being trained to do something you love. Now you can finally prove how good you are. A little nerve-racking, but completely exciting. 13. You get a little more respect. You have a college degree sitting on your desk. You put in the hard work, and you have proof of your knowledge. Other people can’t help but respect you for that accomplishment. 14. You are eligible for a Master’s degree. OK, so maybe going back to school isn’t exactly what you had in mind. But two more years and you could have a Master’s degree. 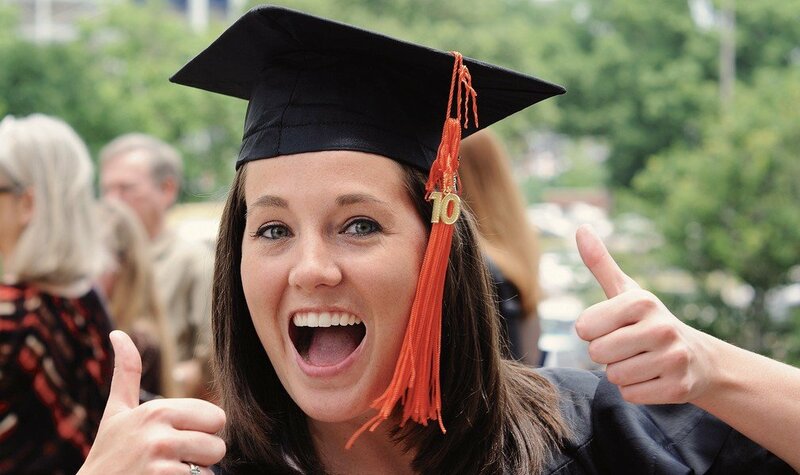 Only 8 per cent of Americans have a Master’s degree, and you can be a part of that. 15. You’ve accomplished something great. You graduated college. You actually did it! Not everyone has had that opportunity, and you really should be thankful and proud of what you have accomplished. And besides, college graduation isn’t the end, it’s just the beginning. is a writer, traveller, and thrill-seeker who enjoys spicy food and trying new things. Born and raised in North Carolina she comes from a tobacco town that was always a little too small for her. Her goals in life include travelling to every country in the world, swimming with sharks (without a cage), and becoming a pastry connoisseur. She is close to becoming a journalism graduate of Liberty University in Lynchburg, VA. Her passions include painting, film photography, and working on her sarcasm.